Galerie Derouillon is pleased to present the second solo exhibition of the painter Guy Yanai in Paris. 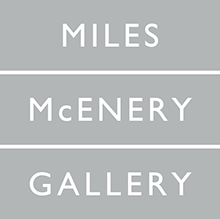 Opening reception: Thursday March 16th, from 6 to 9pm. Beginnings have a personal resonance for Yanai. He has spent his life starting over, moving between continents and across countries--new friends, new home--finally coming full circle and settling where his journey first began, in Israel, the land of the displaced. But even there he remains a foreigner, ensconced in his studio on a shady street in south Tel Aviv, rootless and moveable as the potted plants he often likes to paint. Far from disorienting, this outsider’s gaze is the perfect position for a painter who loves to look. Love of Beginnings is Yanai’s second solo exhibition at Galerie Derouillon. At the centre of the show are three oil paintings, arranged in no particular order or sequence. Club Med Serre Chevalier (2017) depicts a resort in France, based on photographs taken by tourists and posted to Tripadvisor. 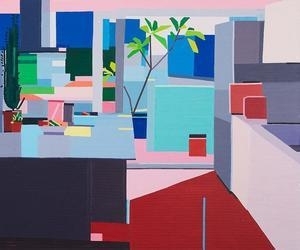 Kitchen (2016/17) is a view of the artist’s apartment in Tel Aviv. The Piano Lesson (2017) is Yanai’s transcription of Matisse’s painting of the same title from exactly 100 years ago. They depict three very different experiences, in different times and places, figural and metaphorical. They present the viewer with three beginnings, but as each scene is treated with Yanai’s stylistic flatness, unassuming and unsentimental, we could hardly guess which path leads to “a sort of hell on earth disguised,” (a holiday destination for middle-class families in the South of France), the purgatorial humdrum of domestic daily life (the kitchen) or an intimate portrait of personal paradise, (Yanai’s own son playing piano, by way of Matisse). The process of painting in of itself, however, betrays the apparent non-relationship between these paintings. Painting is slow and primitive, “like a caveman,” as Yanai puts it. The intense labour his painting demands means we have to ask: why paint this? Out of the cognitive dissonance between a kitchen, a piano, and a holiday, Yanai carves frozen moments in time (perhaps they could be called ‘decisive moments,’ since Yanai’s work has a lot in common with time-based media) that give a sense of belonging. These are the fragments that place us, much more than nationality or history. Yanai took this ahistoric atmosphere--and the exhibition title--from the 1993 autobiography of JB Pontalis, the philosopher, psychoanalyst, and writer. The artist first read the book more than a decade ago, when his shrink lent him her personal copy. Yanai was touched by the gesture (as he says, “shrinks don't usually give you books”). On opening it, he found the pages were covered with his therapist’s private markings and scribbled notes. It could be that this voyeuristic reading experience--reading through someone else’s reading--affected Yanai as profoundly as Pontalis’ lyrical writing. The trio of paintings is, like Pontalis’ reflections on his life, exquisitely open-ended; but they are also a meditation on looking. In the contemporary condition, we are constantly looking through someone else’s eyes. We understand the world through other people’s experiences of it, mediated through images on screens. How can we see things we’ve seen a thousand times as if for the first time? How do we stay in the same place but begin again? Yanai’s paintings search for the frisson of the native glance: he returns to the kitchen he sees every day, but had never painted before; the vacation village he hated but revisits through other people’s idealistic snapshots, or the Matisse masterpiece millions have looked at but that he wanted to make his own. By looking at looking, Yanai’s new paintings are connected with another book: Italo Calvino’s If On A Winter’s Night A Traveler. Calvino’s postmodernist novel, originally published in 1979, gives us ten openings chapters that never continue. In those chapters, as in Yanai’s paintings, the main protagonist is you--the person standing in front of the painting, doing the looking. It’s you who decides the journey, and where the story ends, within this non-place the artist creates.